Logistically it would not have been complicated for the U.S. kit home manufacturers to ship their products abroad. We have some evidence that kit homes were sold outside of the U.S.
Aladdin was the king of international sales. In its advertising, the company said, "Aladdin houses stand in every part of the world...". Aladdin customers built houses in Canada, England, France, Switzerland, Germany, Czechoslovakia, Liberia, Iceland, Venezuela, Chile, Mexico, Hawaii, Philippines, Japan (for the American Red Cross), Australia, the Arctic Circle, and Tahiti. In its 1915 catalog, Gordon-Van Tine had a testimonial for a house in Guantanamo Bay, Cuba, and an earlier catalog had a testimonial from Saskatchewan, Canada. The company also sold houses in Japan, Tahiti, and South Africa. We know that Sears sold kit houses in the United States and Canada. In a 1915 letter, the Lewis Manufacturing Company mentioned that the company had shipped houses to France. Recently I stumbled across this advertisement when doing research. November 1926 ad in the NZ Truth of Wellington, New Zealand. 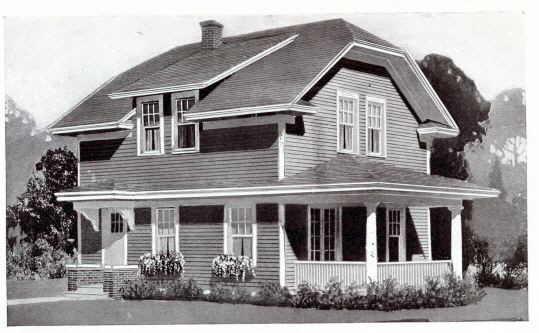 New Zealand Popular Homes, Ltd. of Wellington began selling Gordon-Van Tine houses in March 1926. "Available for immediate possession a few Charming Homes at the sunny localities at Karori and Island Bay", trumpeted the ads. New Zealand Popular Homes said that their carpenters could have a house completed in a month. I believe I located two of these houses on Milne Terrace in Island Bay. 28 Milne Terrace, Island Bay, Wellington, NZ. Photo courtesy of Google Maps. House on Milne Terrace. No house number. Hidden behind a fence and some bushes... is this a kit house with an expanded second floor? Photo courtesy of Google Maps. Cynthia Coomber of the Wellington Southern Bays Historical Society believes that other houses on Milne Terrace may also be Gordon-Van Tine models. Unfortunately I do not have photos of these homes and Milne Terrace is not on Google Streetview. Another Gordon-Van Tine house is in Karori. 3 Campbell St., Karori. Photo courtesy of Google Maps. Ad from the NZ Truth, March 1927. I don't recognize the top two models as being from Gordon-Van Tine, but I don't have access to all the old catalogs. The company had many models like the third house, but it's hard to see the detail in this scan. 4 Ranelagh, Karori, Wellington, NZ. This is the first house in the advertisement above. Photo courtesy of Google Maps. 12 Ranelagh, Karori, Wellington, NZ. This is the first house in the advertisement above. Photo courtesy of Google Maps. 16 Ranelagh, Karori, Wellington, NZ. This is very similar to the second house in the advertisement above. This house has a side gabled roof, not a hipped roof. Photo courtesy of Google Maps. By January 1928, another company, Villas Limited, had taken over the New Zealand distribution for Gordon-Van Tine. After 1928 it does not appear that any company was selling Gordon-Van Tine models in the Wellington area.